Mob Wives Reboot has taken FULL EFFECT as almost all of the cast has begun filming with each other. From Ramona to Carla to Karen to Renee to even Philly's own Alicia and Natalie G have all begun filming with each other. Back in November Renee checked herself back into rehab in Miami at Summerhouse Detox after she had some surgery to fix a botch body job that she had on season 2 of Mob Wives that didn't go well. She spent 10 days at summerhouse before transferring back to Transitions Rehab where she finished a full 60 days stint. She checked herself out of rehab on Thursday January 25th and flew back to Staten Island where she began filming scenes for the upcoming reboot of the show with Alicia DiMichele. The two documented their reunion on social media. We're told Alicia and Renee made amends and that Alicia even got to meet Renee's grandson baby AJ. Alicia wasn't the only one who Renee made amends with. We're told that before leaving Miami, Renee met up with Natalie Guercio as well. They too documented their reunion on social media as well. Sources have told us that the two philly girls have signed on to do the reboot of Mob Wives as well. 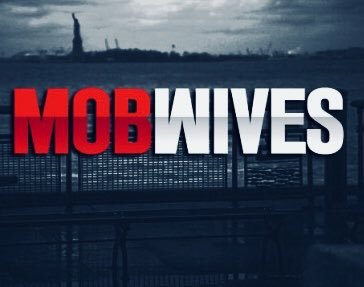 So far the ones who are in it for the reboot of Mob Wives are, Renee, Carla, Karen, Ramona, Alicia, and Natalie Guercio. Even though vh1 has not picked Mob Wives for the reboot (and neither has any other network) this cast lineup looks like its gonna be good to watch if and when it airs. 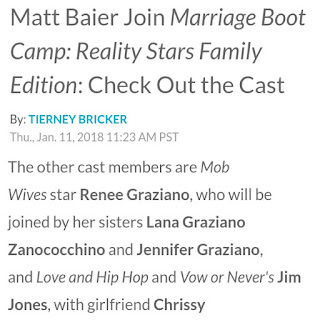 Back in May we got word from unnamed sources that Mob Wives Renee Graziano was going back into the Marriage Boot Camp house again. This isn't the first time she's been on the show. In fact, back in May 2016 she filmed the show with her then boyfriend Joe. 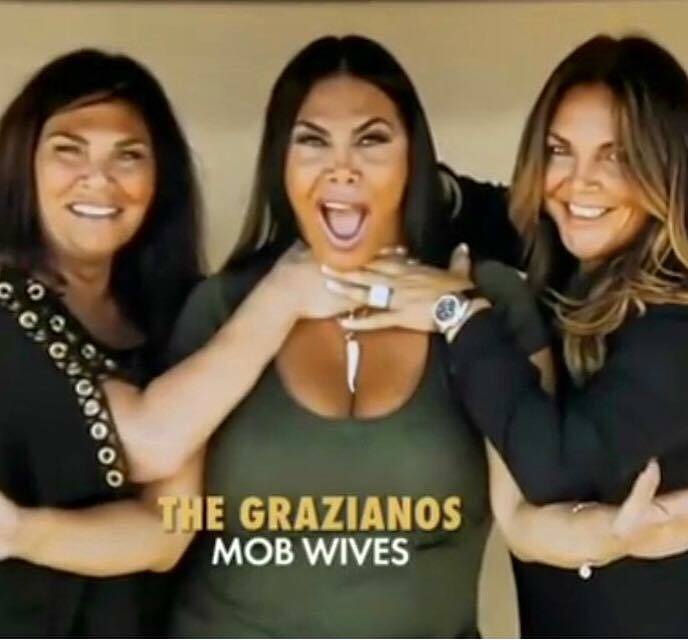 This time around however, is the family edition of Marriage Boot camp where Renee will be going into the house with her sisters Jenn who the creator of Mob Wives and their older sister Lana. Also a part of the cast is Teen Mom OG Amber Portwood with Matt Baier and her mom, Love and Hip Hop Chrissy Lampkin with Jim Jones as well as his mom Mama Jones, Real Housewives of Beverly Hills Brandie Glandville and her dad. We're told they filmed this over the summer May/June for two weeks and it will air in March 2018. 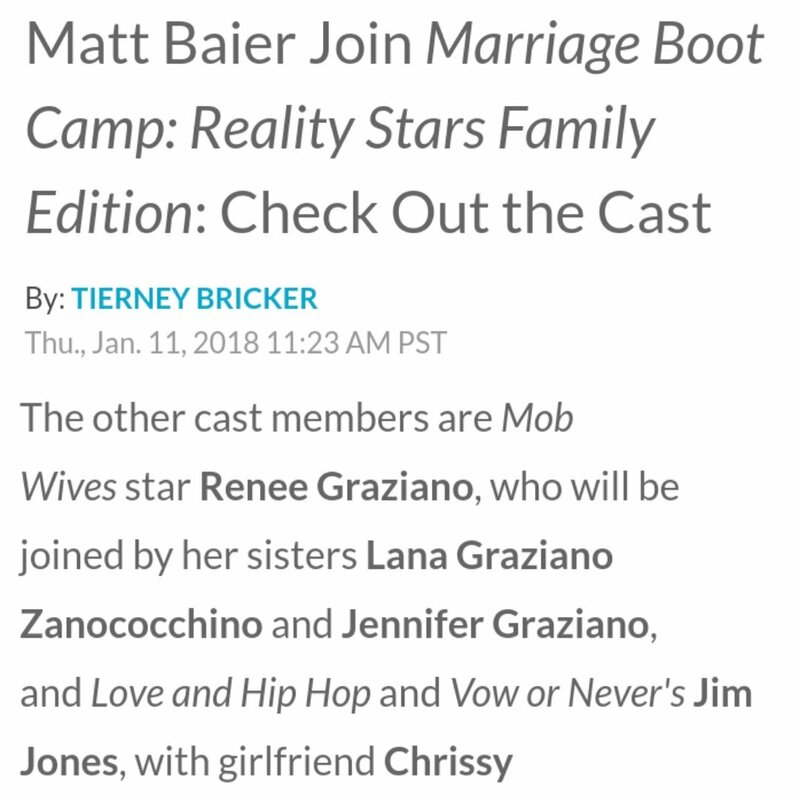 Its been a few weeks since Mob Wive's creator Jenn Graziano (who is also Renee's sister) announced that she is rebooting the show. Since then everyone has had mixed reactions including fans. Some want some of the OGs to come back while others think it won't be the same without the late Big Ang. As of right now all of the OGs have confirmed that they're returning except for Drita Davanzo who has said no. Today Jenn took to her facebook to give fans an update on how the casting is going so far. Jenn also took to her twitter to tell us that the Mob Wives reboot will air sometime in 2018 and fans couldnt be more excited for this. As we previously told you, OG Renee Graziano is currently in Rehab in Miami as she is still receiving treatment from a type of body surgery that she had in Oct that didn't go so well. However, just because Renee's in Miami doesn't mean she didn't weigh in on social media with her thoughts about her OGs cast. On December 17th Renee took to twitter to let Karen and Carla know that she misses them and wants them to visit her in Miami. Currently, there is no word yet as to how long she will be in rehab but we're told she's doing great. We'll keep you updated on how this reboot goes. There has been non stop talk about the reboot of Mob Wives. 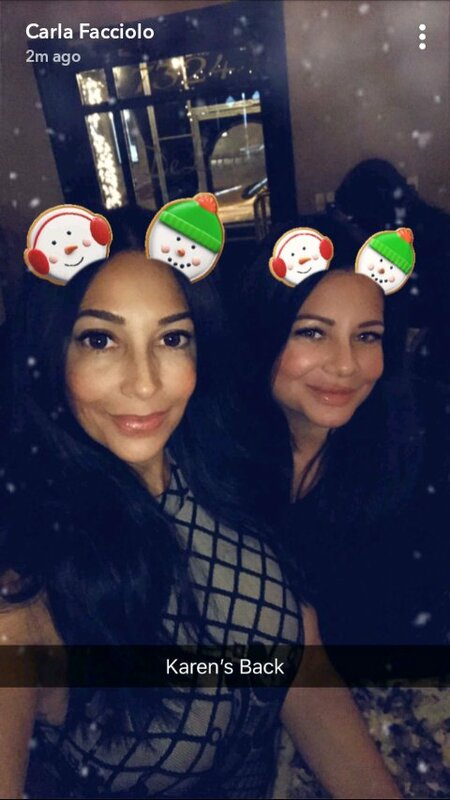 Recently Mob Wives creator and Renee's sister Jenn Graziano and Carla Facciolo did an interview with the local Staten Island Advance expressing how much the late Big Ang wanted the show to go on without her. In fact, Carla explained that they were with her when she passed away and that Ang told her and Jenn that she wanted the show to keep going without her. Apparently Ang's sister Janine read this in the news and she wasn't too happy about it. She posted the photo above letting them know she wasn't too happy with them doing the reboot. Even Drita got in on this photo in the comments. 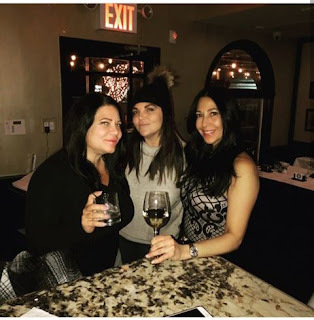 Drita explained that Ang told her that Karen Gravano came into the Drunken Monkey and told her (Ang) if she (Ang) sided with her (Drita) and not her (Karen) then Karen would call her (Ang) a rat. To find what else Janine had to say make sure you check out her instagram live story that someone posted on youtube. Janine also mentions that Carla and Jenn never visited Ang and had that conversation about Ang saying she wanted the show to go on. We did some digging online and we came across this interview that Karen Carla and Renee did around the time Ang passed away with ENews. When you get to the end of the video Renee does mention that they saw Ang in the hospital the week before she passed away BUT there was no mention of them saying that Ang told them that the show must go on. We'll keep you posted on how this turns out. We previously told you that Mob Wives OG Karen Gravano was scheduled to come back to New York to have a sit down with Carla Facciolo about a possible reboot of the show. Well now, we're told that sit down did happen and only we have the photos to prove it. We're told the two girls met up with Mob Wives producer Jenn Graziano at Deluca's resturaunt in the city to have their meeting. In fact, Carla took to snapchat to let everyone know that Karen was indeed back in town. No word yet on how the meeting went but we're hoping it went good enough for the reboot to happen. We'll keep you posted with this as it develops. Mob Wives OGs Drita Davanzo and Carla Facciolo aren't the only ones speaking out about their thoughts about a possible Mob Wives reboot. In fact, Mob Wives OG Karen Gravano is also giving her thoughts on how she feels about a possible Mob Wives reboot in the works. Karen confirmed to Carla on twitter that she's been asked to meet for a "sit down" this week about this idea. So if these two return for the reboot that would mean that only 2 OGs are gonna be a part of it. As we previously told you, Drita has opted out of the reboot because she has her own projects going on which we can't wait to see. At the moment there is no word yet if Renee will return. Sources have told us that Vh1 hasn't picked up the show reboot yet, but it could be a possibility or it could be on another network. We'll keep you posted. Social media is definitely buzzing since the news that Mob Wives might be rebooted. Some of the cast are for the reboot while the other part of the cast aren't for it. Lets start with Drita, she has said recently that Jenn Graziano contacted her about the reboot and she declined to do it for many reasons. One reason is because she's in the process of working on her own project with Jersey Shore's Snooki and JWOW called Celebrity Shore. Another reason she doesn't want to do the reboot is because she has put that behind her. Karen Gravano must've heard about Drita declining her offer because she let it be known that "Drita should have been lucky to be there in the 1st place" when she posted a message on instagram. Next we have Carla's input and she definitely had a lot to say on this. In fact, she asked fans what they thought about the idea of the reboot. She then gave her thoughts about Drita not wanting to do it again. One fan even suggested that they add one of the Gottis. Some of you may recall, Victoria Gotti made several appearances in season 5 with Ang and Renee. Speaking of the late Big Ang, her family even weighed in on their thoughts about the reboot. Her sister Janine is glad Drita said no about the reboot. In fact, she doesn't see how or even why they're doing it since Ang isn't here anymore. So in conclusion the only one who's on board with this reboot is Carla and maybe Karen. We'll keep you posted on who else will join the cast. Why Mob Wives Renee Graziano is Still in Rehab 6 months & Counting PLUS Why Her Son AJ Gave Her an Ultimatum "Its Rehab OR you will NEVER SEE me or your Grandson AGAIN"
Mob Wives Season 3 Finale Ep 313 "Love Hurts"
All Rights Reserved to Mob Wives Sit Down 2013-2017. Simple theme. Powered by Blogger.